Beginning in the 1920s anthropologists, traders, and other admirers of traditional Native American cultures-appalled by the degradation of fine crafts into tourist trinkets-began cultivating a fine-arts market for indigenous textiles, jewelry, ceramics, and basketry. 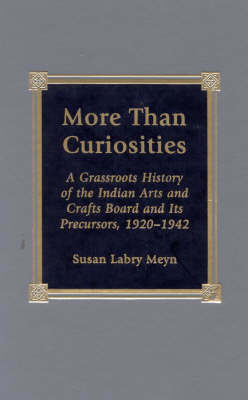 In More Than Curiosities, Susan Labry Meyn explores how this grassroots revival led to the founding of the Indian Arts and Crafts Board in 1935. Meyn demonstrates how the Board and its activities-such as development and marketing of quality arts and crafts, targeted loan programs, and the creation of artisans' cooperatives-not only aided in the development of a source of sustained income for Native artists, but also were pivotal in overcoming the larger Euro-American indifference toward Native culture. Under the leadership of Rene d'Harnoncourt, the Board facilitated cross-cultural understanding and provided the mechanisms that allowed Native American artists to revive traditional practices and adapt them to an Anglo market. Meyn's novel study will become an invaluable contribution to scholars of the period, artists, and anyone interested in Native American studies.